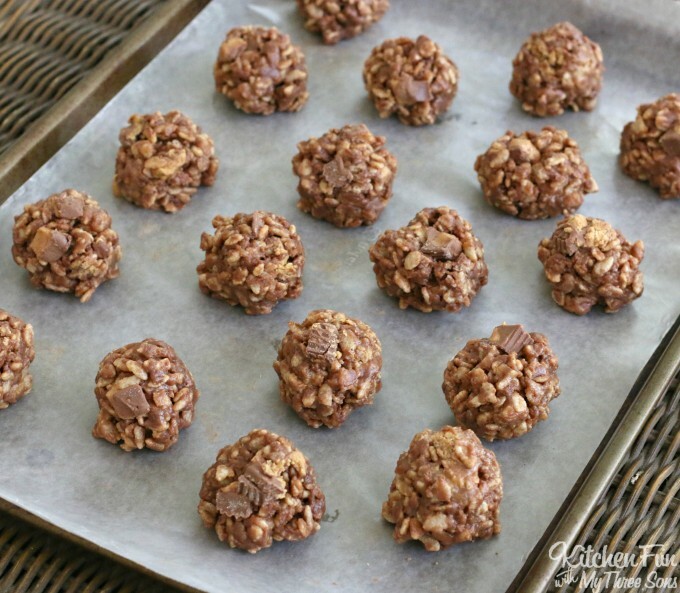 These No-Bake Krispie Reese’s Cookies are the BOMB! 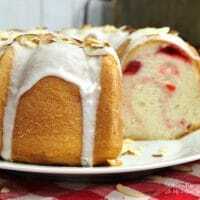 Everyone will rave about these and they are SO easy to make! 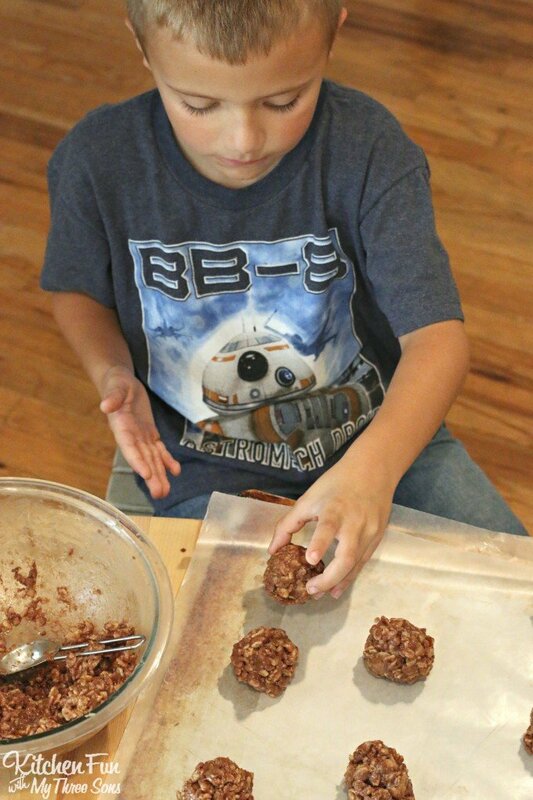 My boys are convinced that this is the best cookie recipe ever…..It’s so hard to eat just one! 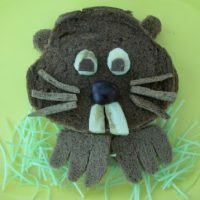 I remember having these as a kid and these were always such a hit with everyone! We will definitely be adding these to our Christmas cookie tray this year and they are so easy to make! 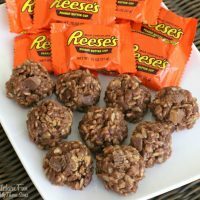 Honestly we love just about anything using Reese’s, but this recipe is definitely the winner of all of them. This is a great way to use left over Halloween candy. 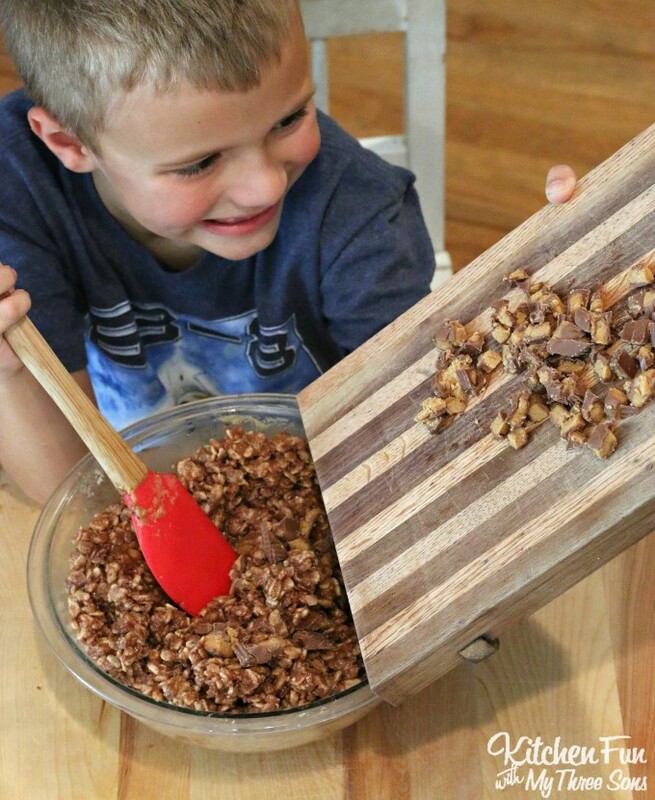 You could also try other candy bars with this recipe…Butterfingers would be a good one to try! Line your baking sheet with parchment or wax paper and set aside. 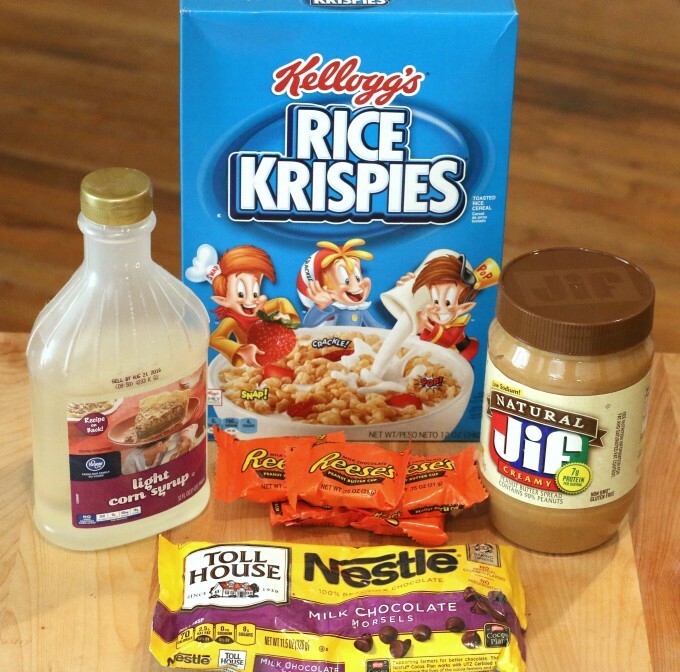 In a large glass bowl, combine your corn syrup, sugar, and peanut butter. Cook on high heat for 2 minutes. Then cook for 30 seconds until your mixture is evenly combined. Mix until well blended and try to keep yourself from licking the bowl! Mix in your chocolate chips quickly while the mixture is still hot. Stir until fully combined…. 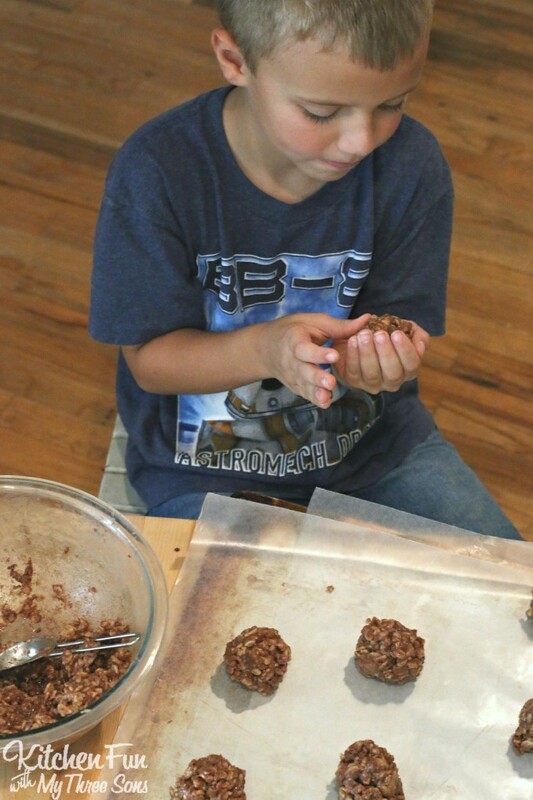 My boys absolutely LOVED these Reese’s Cookies! 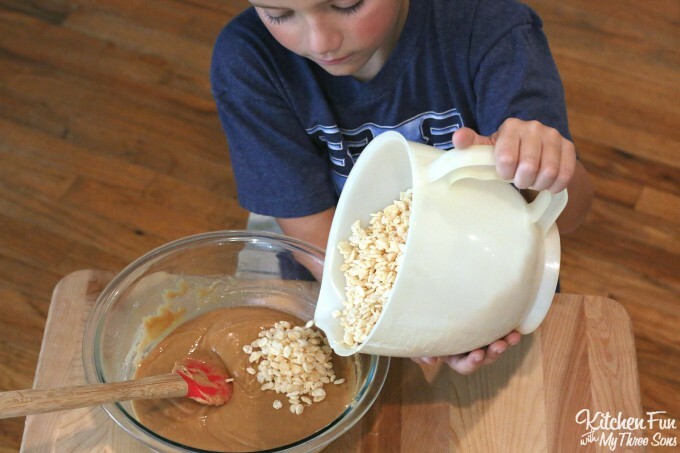 Pour your peanut butter mixture over your Rice Krispies. Mix until well blended. Mix in your chocolate chips quickly while the mixture is still hot. Stir until fully combined. Let that cool just a couple of minutes. 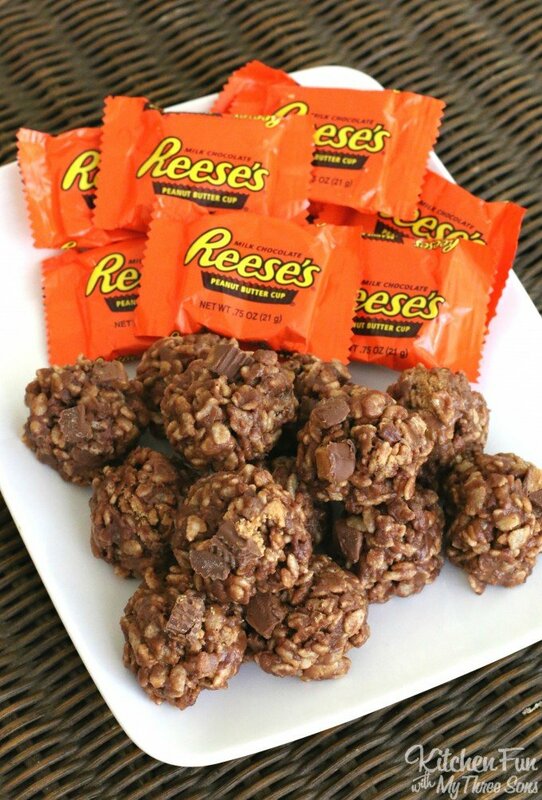 Chop up your Reese's Candy Bars into chunks. Add them to your mixture and combine. 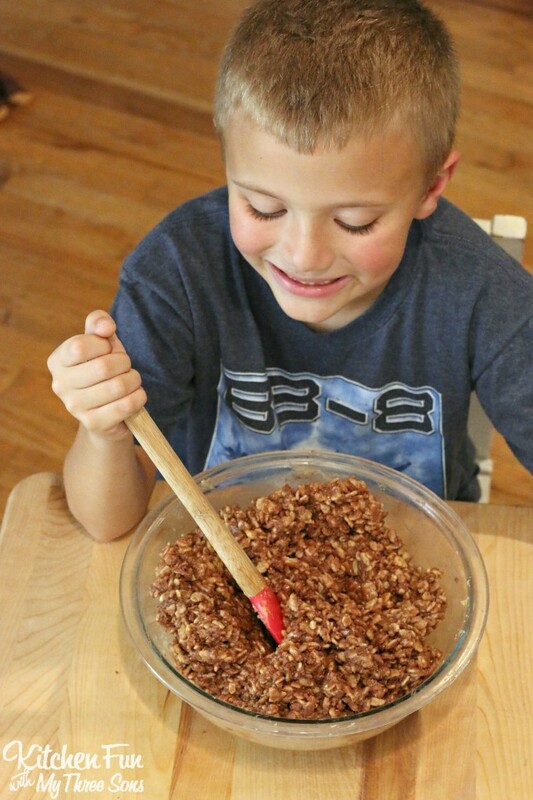 Scoop out balls using a heaping Tablespoon. Place the balls onto your wax paper. Let them set about 15 minutes and serve. These Reese’s cookies can be stored at room temperature in air tight container for about 4 days. Trust me, these won’t last for a day once you try one. You can refrigerate them as well. I am assuming you cook this in the microwave, but what if you don’t have a bowl that can go in micro? how long would you cook if usinf a saucepan on the stove? Hi Carol! Cook on low heat just until it’s all melted & blended. Thanks! Oh yum! 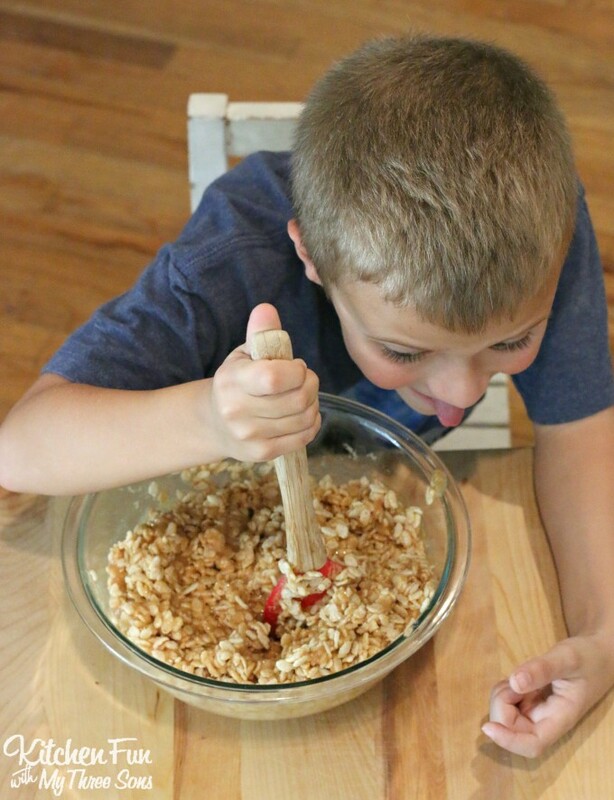 You just made rice crispie treats 100 times better! 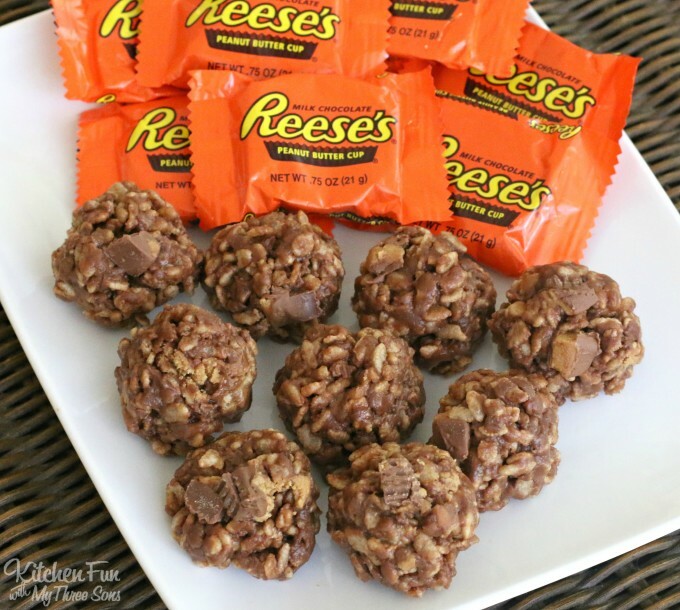 The recipe calls for 5 full size Reese’s so how many fun snack size would I need to use? 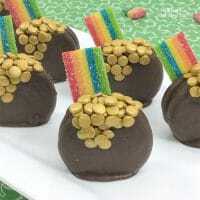 I made these the other day and I used 10 fun size Reese’s and 3 fun size packs of Reese’s Pieces and OMG!! They were so good! Making them again today and using snickers. Thanks for the awesome recipe! you don’t have a print option for this recipe online.